The IEEE Symposium on VLSI Technology is sponsored by the Electron Devices Society – ED and the Solid-State Circuits Society – SSC. At this year’s conference, Micron gave further details on their hybrid memory Cube and TI detailed their studies on TSV induced stress on 28nm CMOS and Chuo Univ described a hybrid NAND + ReRAM SSD stack with better power consumption and product lifetime. 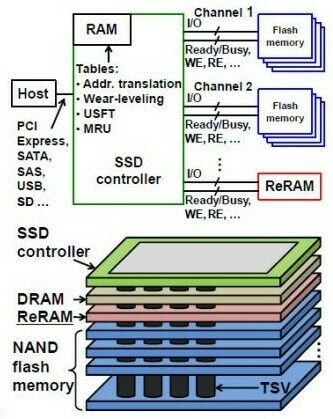 Perofessor Takeuchi of Chuo Univ described a hybrid SSD architecture using ReRAM and high capacity NAND flash memory. When SSDs are used for servers in financial institutions, performance is hindered and power consumption increased because random access is dominant. This causes data to get split up if the size of the data packets are not of the appropriate size (minimum for NAND is 16Kb). 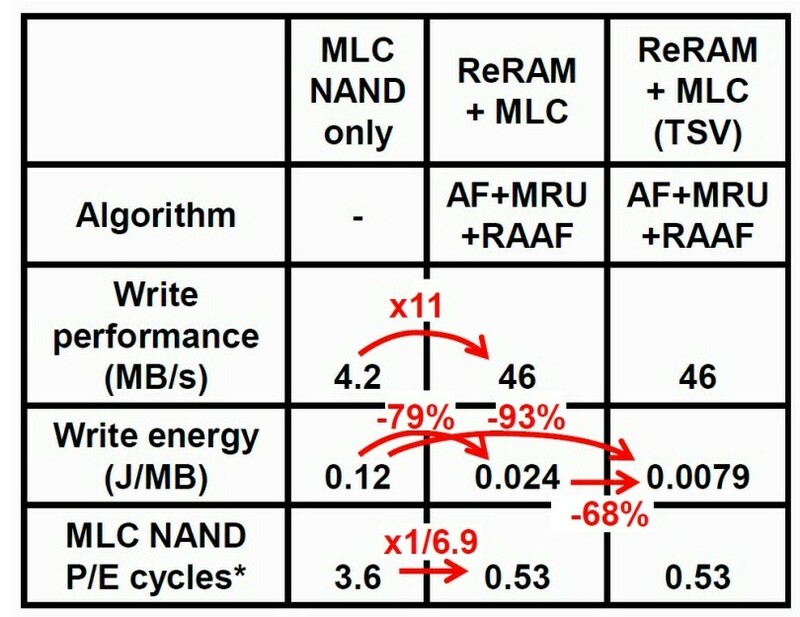 Takeuchi’s memory stack combines a NAND flash memory and ReRAM. ReRAM is used as both cache and storage memories. To overwrite a small amount of data in the NAND flash memory, software transfers the page of data to the ReRAM so that data is not fragmented in the NAND flash memory. A prototype, tested on an emulator, showed that compared with existing SSDs which only use NAND, the hybrid memory stack achieves an 11X higher data writing performance, 93% lower power consumption and 6.9 times longer product life. This assumed that the controller, ReRAM and NAND flash memory were connected by TSV. Although this has been hyped up by several reporters, we should note that it is possible to achieve almost the same results without using TSV. The major gain of using the TSV appears to be a 14% decrease in energy required to write as shown in the comparative table below. It is proposed that SSD in data centers would have to be changed out about 7 times less thus reducing expenses. It should be noted that in order to use the hybrid SSD architecture for different applications, it is necessary to change the controlling software algorithms. The HMC device uses TSV technology and fine pitch copper pillar interconnect. The DRAM logic, responsible for DRAM sequencing, refresh, data routing and error correction is placed in a separate high performance logic die. DRAM and logic are connected by thousands of TSV. The DRAM is a slave to the logic layer timing control. The HMC was constructed with 1866 TSVs on a roughly 60um pitch. HMC electrical performance is are compared to other DRAM modules below. They found that the impact of TSVs on surrounding Si is tensile but that a tensile etch stop layer (ESL) counters the impact of the TSVs on near-surface Si where devices are present. Also, insertion of compressive shallow trench isolation (STI) between the TSV and device will also act to buffer this impact. They conclude that "…the electrical properties of N/PFETs between 4 and 16um of TSVs are negligibly impacted (less than 2.3%)…" and that For Wide-IO Memory-Logic interface applications employing a 40 x 50 um JEDEC TSV array, ESD and decoupling capacitors which do not contain N/PFETs can be placed immediately adjacent to TSVs such that CMOS logic circuitry does not require placement less than 4 um. When last we discussed our hero Lester the incandescent lightbulb [ see IFTLE 98 "Lester the Lightbulb vs CFL and LED: the Saga Continues"] we found out that an actual calculation of the cost of various electrical functions in my household revealed that lighting was responsible for $4.31 per month (that’s for operating 30 bulbs) on your electric bill and that saving three-quarters of that by using Lester’s lighting cousins CFL or LED would therefore save you about $36/year (if you replaced all 30 bulbs), which is not enough to buy you 1 LED bulb. The CFLs whose price was now down to about $4 each (vs $0.25 for Lester) promised 9.1 years of lifetime (at 3 hrs use per day). 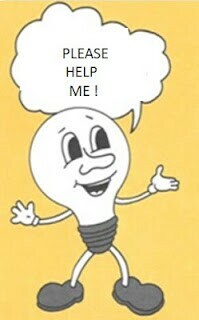 Our test bulbs (CFL and LED) were installed on 08/15/2011 [ see IFTLE 63 "Bidding Adieu to Lester Lightbulb"]. So…cousin CFL lasted less than 11 months (vs the promised 9.1 years). I guess you’d have to call this an "outlier"? Cousin CFL and cousin LED promised me "hope and change"… "to transform US power consumption as we know it today." So far, I’m down $2.43 and need to replace the bulb. Typical Govt BS ! I guess we can understand now why the Govt. got involved to ban poor Lester from the shores of the US. Would anyone actually buy these CFL or LED bulbs, unless they were forced to ? Cousin LED is still burning bright as are all the incandescants that were started at the same time. Be assured we will keep you up to date on cousin LEDs health ! For all the latest on 3DIC and advanced packaging stay linked to IFTLE………………………..
TI researchers have used NanoBeam Diffraction (NBD) to measure near-TSV Si strain in fully processed wafers. The electrical behavior of poly-SiON P/NFET transistors were characterized for full thickness wafers varying temperature, orientations and proximities to isolated and arrayed TSVs. NanoBeam Diffraction measurements of Si strain within 5 um of TSVs were acquired for samples prepared from fully processed wafers, showing that for proximity greater than 1.5 um the impact of TSVs is negligible.